Ingredients: 3 tablespoons Unsalted Butter, at Room Temperature 8 slices White or Chole -Wheat Bread 1/2 Rotisserie Chicken, Meat shredded (2 cups) 4 Ounces Blue Cheese 1 Granny Smith Apple, Cored and Thinly Sliced Preparation Method: * Heat oven to 350° F. Spread the Butter on one side of each slice of Bread, then lay 4 of them on a greased baking sheet, Butter-side down. 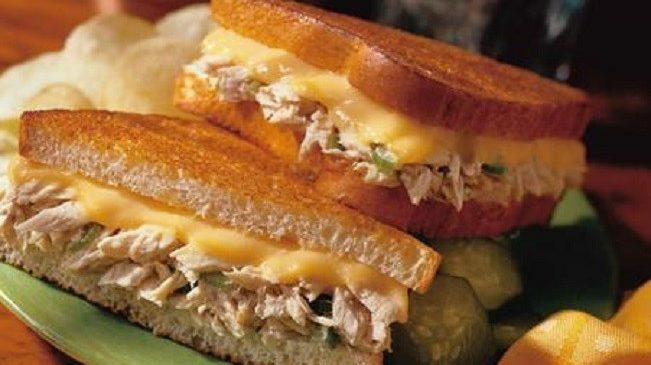 * Divide the Chicken among the 4 slices and top with some of the Cheese and Apple slices. * Place the remaining Bread slices on top, Butter-side up. * Bake for 10 minutes. Turn and bake until crispy and golden, about 10 minutes more. * Cut in half and serve immediately.